Welcome to “5 Questions,” where the number 5 is conceptual rather than literal. Today we feature one of the most acclaimed graphic novelists working in children’s books today, Matt Phelan. Yo, Matt, I’m over here. Yeah, no, look this way. It’s just weird with you staring off into the distance like that. I’m literally right here. Fine, whatever, let’s just get through this. Take us back to the period before the idea came for this book. Is there a “between books” stage for you, when you are not exactly sure what’s next? Is that stressful? Are you walking around with your antenna up, hoping for lightning to strike? Or do you keep a spare file of “BRILLIANT IDEAS” by your bedside for just such occasions? My mind tends to wander quite a bit, so I often have new ideas percolating when I should be focused on the book at hand. I have notes for Snow White going back ten years when I was pitching Storm in the Barn. I have a few ideas on low simmer now that I hope to get to eventually. That’s how I feel about painting my living room and front hallway (and upstairs bathroom, and guest bedroom, and). It’s all on low simmer. But for you that simmer reached a boiling point. Was there a specific moment, or an image, that came to you? Why that particular period in New York City? I was thinking about apple peddlers in the Great Depression (as one does) . . .
. . . and my brain connected that with the stepmother in “Snow White.” I sketched an image of a busy street, people racing by, with a single young woman stopped in her tracks before an old hag holding out an apple. I liked that idea so much that I began to think of more parallels for elements in the tale if they were set in the early 1930s. Yes, that’s part of the book’s pleasure. 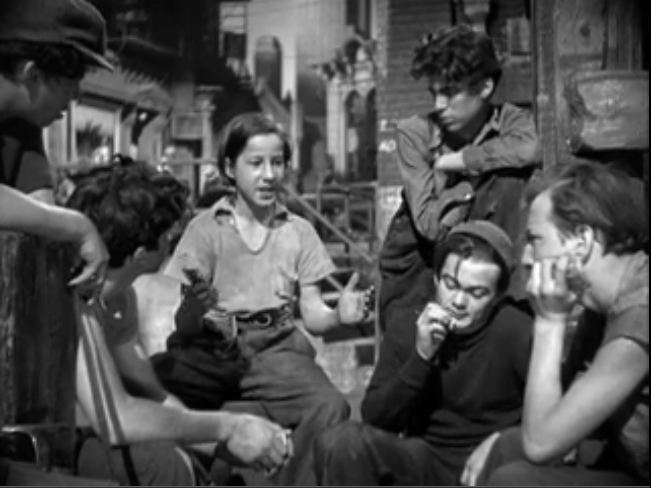 It’s cool how you re-imagined the seven dwarfs, for example, as street urchins. In that case, you had to find a balance between making that allusion, but not turning those boys into cardboard stand-ins for Grumpy and Sneezy and Bashful, and so on. The Seven came to me early on, inspired in part by the Dead End Kids from the movies of the 30s and 40s. But considering their situation –- orphans, runaways hiding in alleys and warehouses at night –- I realized that withholding their names would be of utmost importance to them. That was a clear contrast to the Disney film, where if you remember anything, it’s probably the names of the dwarves. I did give the boys some of the same personality traits in passing, so it would be fun for the reader to make those connections. Those translocations are so much fun. The equivalencies aren’t absolute. It’s not, oh, this kid equals Sleepy. But, well, he does look a little tired. Bringing the elements of the story like the seven dwarves into the time period started as an exercise, but the more I thought about it, the more I became invested in the characters and what I could maybe bring to this ancient story. That’s the thing, isn’t it? The challenge in any retelling is to answer that essential question every artist must face, for any work of art: “So what?” In your case, I think you were able to explore a familiar story, turn it around, pull it apart, and discover new elements. 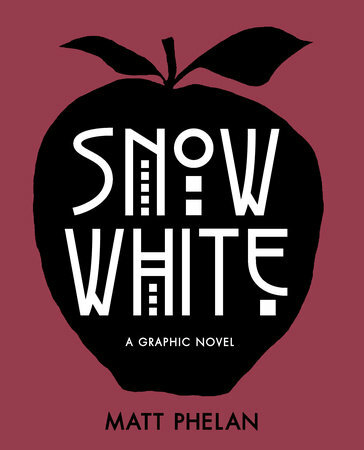 Upon reflection, what did you learn about the story of “Snow White” in the process of your work? Did anything surprise you? I was surprised about how much it started to mean to me on an emotional level. The scene where the boys reveal their names to Snow became the whole reason to do this book. For me, the book is about how there is more goodness in the world than evil, that there is beauty everywhere despite how bleak things may seem. I wrote the story three years ago, but it sadly seems very timely and relevant today. I recently wrote my first road trip book, and one of the best things about it, as an author, was that I knew when/where the story was going to end. It’s comforting to know where you are in terms of beginning, middle, and end. You enjoyed a similar luxury in this case. Yes. I agree. It was refreshing to have a framework to the plot from the start. But the story is so solid that it also allows for invention within that framework. Your book benefits from our familiarity with the classic story. Everybody knows it. That known structure gave you more freedom to pick your spots, skip over the boring bits. You didn’t have to fill in every blank space. Would you agree with that? Absolutely. I also use “chapter headings” which look more like title cards in a silent movie. That device acts as a dramatic shorthand. I could write “Late Night at the Butcher’s” and I’ve already set up not only the setting but an idea of what is going to happen there. I agree, that was an effective device, a pause but also a jump-cut into the next scene. Hey, it had to be fun killing off the evil queen-slash-stepmother. In the movie that’s such a tense, dramatic scene. The seven dwarfs are not cuddly and cute in that surging, swelling scene; there’s murder in their hearts. The origin material was dark. That had to a challenge for you, to meet that big climatic moment head on. Were you particularly pleased on the day you figured out she’d not only get electrocuted . . . but she could fall off the building as well. Well done, sir! My ending plays off the Disney one which I think they changed for good reason. In the original Grimm, the stepmother is invited to Snow’s wedding only to find that Snow orders her to dance to her death whilst wearing burning iron shoes (for the amusement of the wedding party). A tad sadistic for our heroine, I think. Disney used lightning, but I opted for her to go up in lights on the marquee of the Ziegfeld theater. The fall was probably a nod to King Kong now that I think of it. How do you make these paintings? How many are there? 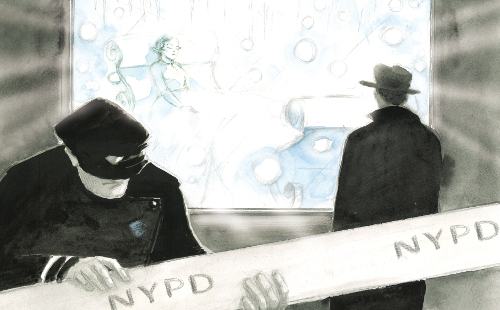 I ask because my sense is that when I look at some graphic novels, many individual images appear rushed, unfinished. But in Snow White, I can see –- I think –- the deep care and commitment to every single image. It’s so impressive. I use traditional media: pencil, ink, and watercolor on watercolor paper. I’ve made it a rule since my first graphic novel to never ever count how many individual panels are in the book. Each panel is a painting, maybe three to six per page, more than two hundred pages . . . it’s a lot. Yeah, the “hike” is not about the number of steps it takes. It’s all part of the greater whole. 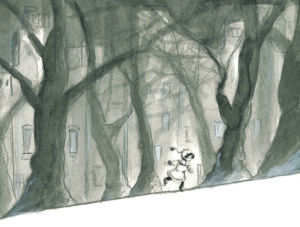 I wanted each panel to have the correct mood and atmosphere, but at the same time I never wanted one particular panel to cause a reader to stop and dwell on it. I want you to keep moving. Pace is important. And pace is mostly a function of layout, right? The decision of multi-panel spreads compared to, say, a strong single image. At what point do you make those design decisions? 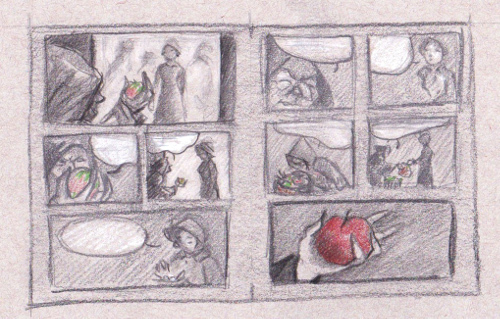 The actual sizes of the panels are decided when I’m doing the first loose thumbnail drawings. You are correct about size and number of panels dictating pace. It’s like a musical score, in a way. 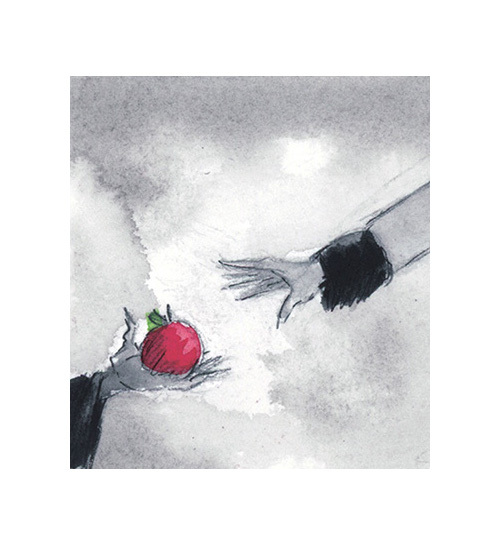 For Snow White, I did try something a bit different, in that each page was drawn completely fresh on a blank sheet of paper. I had rough sketches to inspire me, but I did not enlarge the sketches and use them on a light-box as a guide like I’ve done before. By drawing it again fresh, I hoped to catch the energy and life of the sketches. If it was wrong, I just drew it again. Watercolor is also a great way to give your paintings energy and unpredictability. It’s hard to completely plan or fix a watercolor painting. You get what you get. That’s an exciting way to work. I relate that to music. A belief in the positive value of raw performance — live in the studio — including the messiness of it. Rather than, say, polishing a song to perfection. Something vital gets lost in the refinement. The flawed version is somehow better. I couldn’t agree more. I’d rather listen to something with mistakes played like the musicians’ lives depended on it than a supremely polished “perfect” performance. I’ll take the Replacements over Steely Dan any day. I know you love music. Do you listen when you paint? Did this book have a specific soundtrack, or sonic influences? I listen to music when painting and maybe during the writing (but only instrumental music). I do make playlists for the books. Snow White’s playlist had some leftovers from Bluffton, plus soundtracks like Bernard Herrmann’s score for The Magnificent Ambersons and Max Steiner’s great score for King Kong. I also included The Jazz Age, a recent record by the Bryan Ferry Orchestra that arranges Roxy Music songs in a hot jazz style. It’s brilliant. Yes! I have The Jazz Age. At first I wasn’t too keen on the idea, it felt gimmicky, but then I heard it. Good times. I’ll have to explore the scores by Herrmann and Steiner. Thanks for the tip, Matt Phelan! 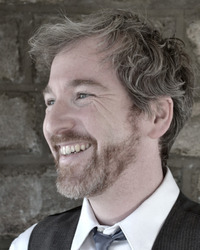 MATT PHELAN does a great job with his website, which he stores somewhere on the interwebs. You can visit for free, but like the Hotel California, you may never leave. 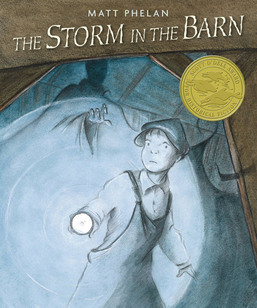 Matt splits his efforts between graphic novels (The Storm in the Barn, Bluffton, Around the World), picture books (Marilyn’s Monster, Xander’s Panda Party, and more), and whatever else inspires his attention. Like, oh, listening to Replacements records. ABOUT THE “5 Questions” Interview Series: It’s a side project I’ve assigned myself, hoping to reach 52 authors & illustrators in the course of a year, always focusing on one book. Scheduled for future dates, in no particular order: Bruce Coville, London Ladd, Lizzy Rockwell, Jeff Mack, Matt Faulkner, and more. To find past interviews, click on the “5 Questions” link on the right sidebar, under CATEGORIES, and scroll till your heart’s content. Or use the handy SEARCH option. Awesome reading. I learned so much about the personality of the Author. I will buy his books. Fascinating! Sorry, Mary, it’s a moderated system where people can’t comment without my approval. It’s a process that limits the amount of crackpots. Obviously, it’s not foolproof. Cheers!